Photos: KMG/Michael Sterling Eaton — IBF/IBO Heavyweight Champion, WBO/WBA Heavyweight Super Champion and „The Ring Magazine“ World Heavyweight Champion Wladimir Klitschko will face Alex Leapai from Samoa on April 26th at the König-Pilsener-ARENA Oberhausen (Germany). 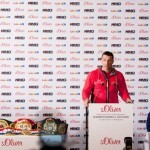 The press conference of Champion Wladimir Klitschko (61-3, 52 KOs) and mandatory challenger Alex Leapai (30-4-3, 24 KOs) took place in Düsseldorf. The media presence was quite impressive with about 100 representatives and 20 camera crews. 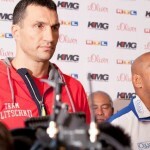 Once more Wladimir Klitschko pointed out the respect for his opponent: “I’m looking forward to the challenge. We can see that Alex is highly motivated and he is here to win. 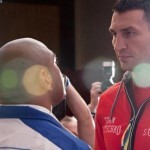 I will not underestimate him on Saturday evening”, said the 38 year old but added: “Welcome to big time boxing, Alex!”. His opponent was also very respectful, but did not seem meek at all. “You are getting the best show, you are able to watch. I am here to win. I have been dreaming about this for many years. 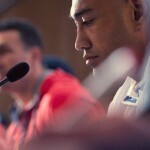 Everybody will see this fight and we will write history”, says Leapai. There was no trace of provocation. Just a little interruption from former World Heavyweight Champion Shannon “The Cannon” Briggs caused quite a stir. 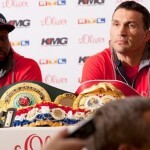 Briggs, who already loudly demanded a fight against Wladimir Klitschko at Klitschko’s Training Camp in Miami weeks ago, visited the press conference and expressed his wish once again. The fight will be broadcasted live on ESPN in the USA, RTL shows it in Germany.